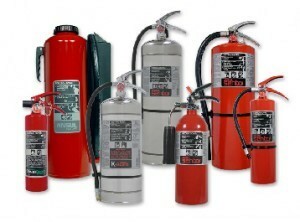 Portable fire extinguishers are the first line of defense against small fires in most buildings. In fact, while sprinklers, alarms, and other fire protection devices are only required in certain occupancies, portable fire extinguishers are required in every single business. Not all extinguishers are created equal, however, and Heritage team of experts is here to help you decide which type and model is right for the hazards you need to protect. In addition, we can perform a full assessment of your location to ensure you have the number of extinguishers required by code, and that they are spaced properly throughout your facility. Once installed, our team will automatically remind you when its time for the annual re-certification of the extinguisher. Our experienced instructors can also perform OSHA-required training of your employees on the use of fire extinguishers, to ensure they are ready to react safely if a fire occurs. 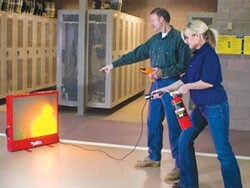 The Bullseye system is a revolutionary digital extinguisher training simulator. Bullseye senses where the user aims and sweeps the laser extinguisher and automatically varies the LED driven digital flames in response. This allows the trainees to effectively use a fire extinguisher without the cost and cleanup associated with using dry chemical or CO2 extinguishers. The Bullseye’s electronic control system responds to the trainee’s actions, putting the fire out only when the extinguisher is used correctly. Has the ability to grade users making it easy to monitor improvement and proficiency.